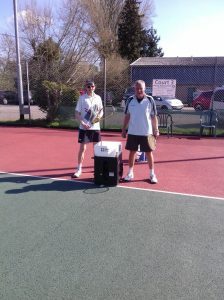 Sunday the 24th March saw the men get together for the summer league training and we saw some real spring like weather. 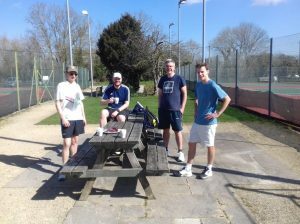 The chaps played a round robin struggling with very bright sunlight in our faces at the spectator end of court 3! We had a tea break with loads of milk chocolate digestives (what else!) and then took on the most difficult challenge of the day; hitting balls launched by our reincarnated ball machine! Gosh if you want a work out have a go with the ball machine. If you want a real workout get Jonny to set up the machine; but be afraid…. and i mean very afraid!! All in all a nice relaxing mornings tennis ready for the summer fixtures. Best player on the day…that BALL MACHINE!.